Fee-bee! Hey Sweetie! Cheer, cheer, cheer! Birdie, birdie, birdie! What magical tweets to hear on a cold winter morning! Sometimes I’ll find myself transfixed on birds while opening up the Swamp Park’s storefront. I’m lost in meditative thought, while my eyes are glued on my colorful tweeting friends. Just for a moment, you’re peering into a whole diverse society. The Cardinals, show off their bright red winter jackets. The Chickadees are bouncing from ground to feeder, ensuring they sample the finest seeds. The Woodpecker is knocking feverishly against a long needle pine, to awaken their next meal. The Blue Jay calls a constant loud Jeer! 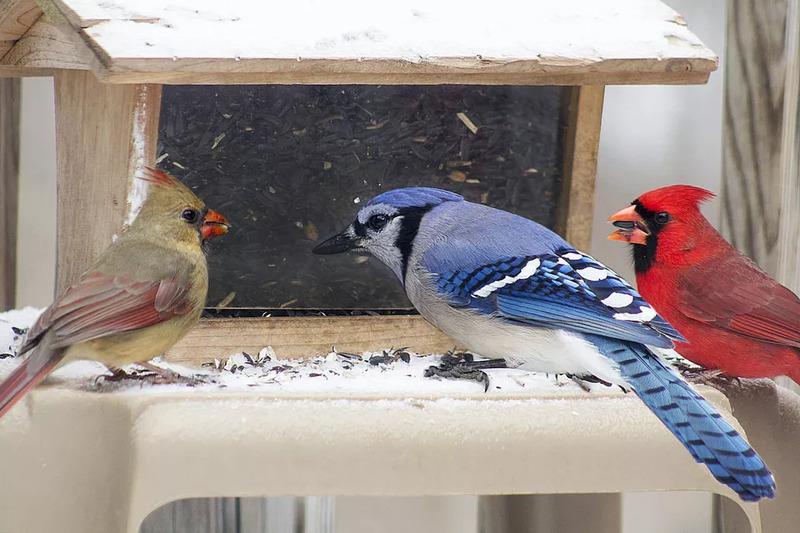 This brings the attention to their friends, that awesome suet has been found. But wait why are they still here? Don’t all birds migrate during the winter? Why do they stay? How do they keep warm when the air temperature is below freezing? What foods do they need to eat? We’ll be answering all those questions in a 2-part blog series. This first blog will be about migration and our wetland fowls that visit our park. The second part will be about backyard birds as to why they stay, and their winter adaptations. Migration is where an animal will relocate themselves during certain times of the year for food, mating, and climate reasons. Sometimes migration can be short-term or a long-term commitment for animals. Yes, some birds will migrate from the northern hemisphere to warmer southern hemisphere. 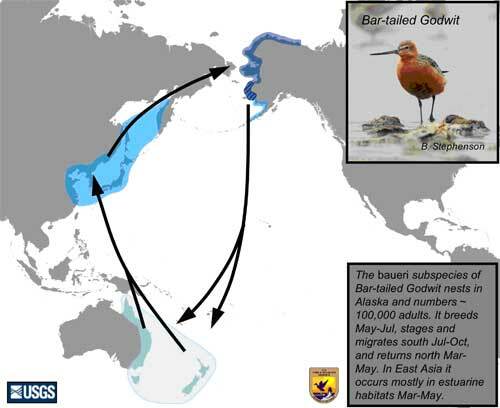 For example; the entire population of Bar-tailed Godwits will begin their non-stop trek from Alaska to New Zealand during Alaska’s winter months. They don’t just make this trip once, but twice a year! This long journey is really dangerous. Often times, the weaker Godwits will not make it to the final destination. 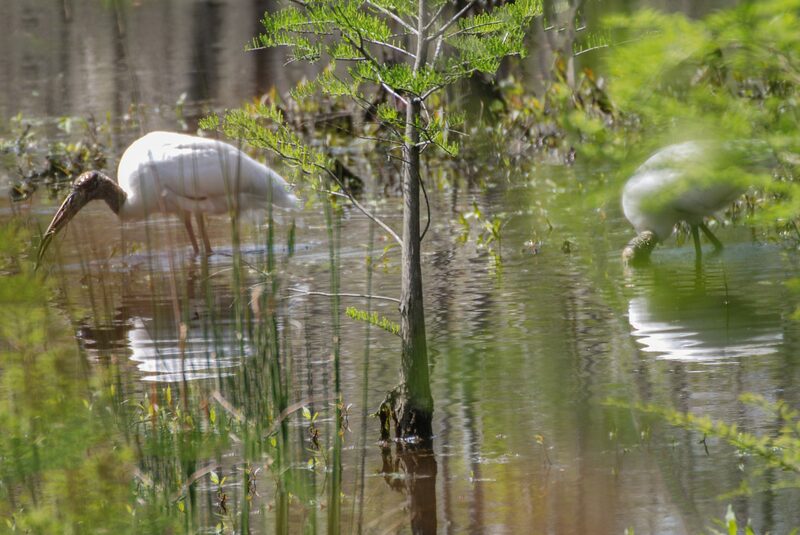 At the Swamp Park, we have a variety of migratory waterfowl, who visit us every year, such as the wood storks, herons, and gulls. Wood storks are tall white birds with black flight wings and a large heavy bill. Wood storks will fly from Florida in the spring, and travel up the east coast reaching to the southeastern part of NC for the summer. These storks will make a home in our swamp during this time. They are often found on top of our cypress trees. During their stay, they’ll find mates, and begin a family. They’ll lay their eggs at the bottom of the cypress tree usually situated on top of a mud island. Once the young mature, the wood storks will leave us in autumn and go to Florida for the winter. What is really amazing is the relationship between alligators and wood storks. Wood stork’s eggs are highly sought after by scavenger predators like the raccoon, and possums. The alligator really enjoys eating tasty small furry mammals. Since the wood stork’s eggs bring a lot of traffic, the alligator will patrol the perimeter of the mud island. How cool is that! The alligator will provide some protection while using the stork’s eggs as bait! As a precaution the wood stork will build their nest at least 5 ft away from the water’s edge, so they don’t become gator food. We have other species of herons, and gulls that will also make these visits to our park for the same reasons. We’ll discuss more them in our future blogs. However, we do have one waterfowl that stays with us, wood ducks. The wood duck is unlike most other waterfowl in the sense that they nest high in tree cavities or built boxes. They have very strong claws, which allows them to perch on trees branches. In January they’ll begin to pair and produce two broods (a family of young ducklings) in one year. It is the only North American duck that will do so. Wood ducks have been known to nest as far as a mile away from water, but they typically will nest directly over the water. The female will lay anywhere from 6-16 eggs. They have also been known to “egg-dumping”. This is when a female will lay some eggs in another’s nest and having other females raise her brood. After one-day ducklings have hatched, they will jump out the nest and find their way to water. The mother will call for them, and she does not help in any way. Ducklings can jump out from the nesting hole higher than 50 feet without any injury. 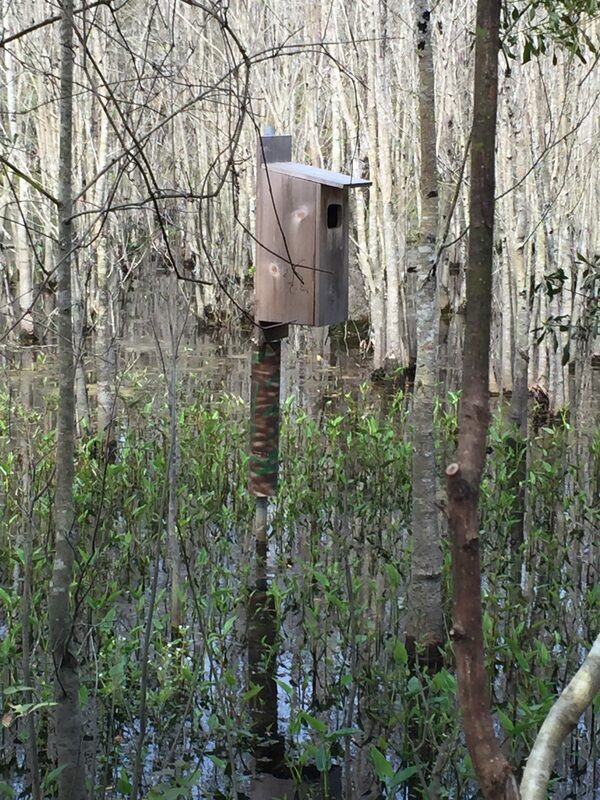 This time of year, it is very important to do maintenance on any wood duck boxes. At the Swamp Park, we have a total of eight boxes. We will empty, clean, and remove any old nest from the boxes. 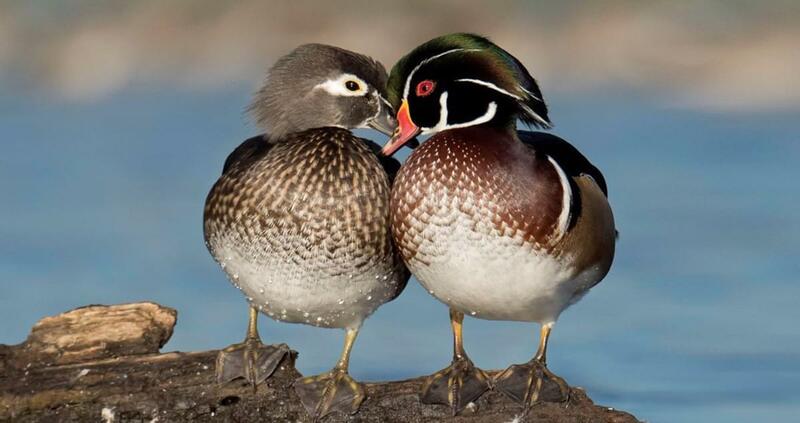 Wood ducks are unable to make their own cavities and provide their own nesting materials. Once the old material is emptied then we will provide new nesting materials (straw) in the box. We will check the overall structure of each one and be sure our predator guards are in good condition. We will clear up any low branches that may be too close to the box, this will help to prevent predators as well. The boxes will then be ready to go for spring ducklings!! Also below are additional information from experts about our visiting migratory birds and wood ducks. If you have any questions or concerns leave a comment on our Facebook, Tumblr, or Instagram page and we’ll answer! In next week blog, we will further discuss our backyard avian friends and how they adapt to the chilly months. If you like this blog about our bird friends then check out our blog about reptilian winter survival adaptions. “Bar-Tailed Godwit.” Audubon, Audubon: Guide to North American Birds, 1 Mar. 2016, www.audubon.org/field-guide/bird/bar-tailed-godwit. 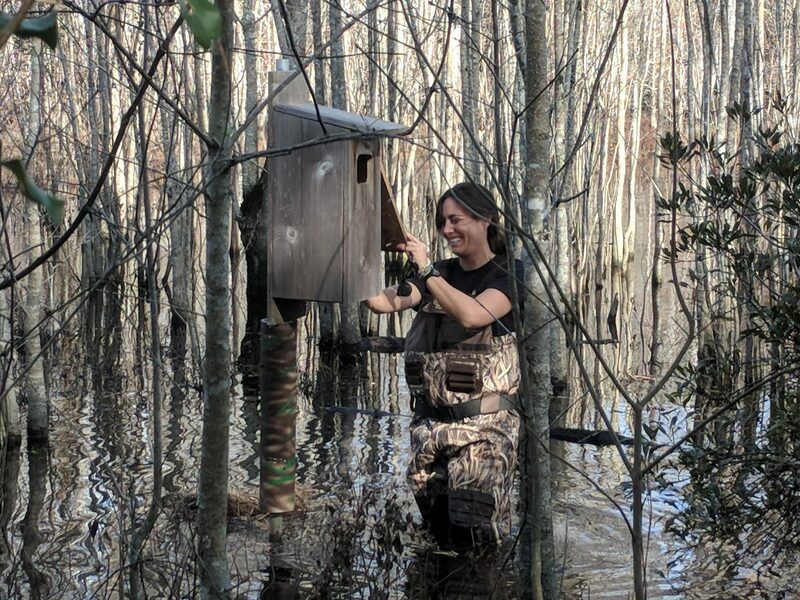 “Cleaning and Maintaining Wood Duck Boxes.” Wetlands, Conservation, Waterfowl, Duck Hunting – World Leader in Wetlands Conservation – Ducks Unlimited, Ducks Unlimited, www.ducks.org/conservation/waterfowl-research-science/cleaning-and-maintaining-wood-duck-boxes. Hansford, Dave. “Alaska Bird Makes Longest Nonstop Flight Ever Measured.” National Geographic, National Geographic Society, 14 Sept. 2007, https://news.nationalgeographic.com. “In the Everglades, birds nest near alligators for safety. But what’s in it for the Gators? – LA Times.” Los Angeles Times, Los Angeles Times, www.latimes.com/science/sciencenow/la-sci-sn-alligator-bird-alliance-everglades-20160303-story.html. Krause, Lisa. “Everglades at a Crossroads: Shrimp, Alligators Key to Success.” National Geographic, National Geographic Society, 3 Jan. 2001, www.news.nationalgeographic.com/news/2001/01/0103everglades.html. “Wood Duck.” Audubon, Audubon: Guide to North American Birds, 4 Mar. 2016, www.audubon.org/field-guide/bird/wood-duck. “Wood Duck.” , Life History, All About Birds – Cornell Lab of Ornithology, The Cornell Lab of Ornithology, https://www.allaboutbirds.org/guide/Wood_Duck/lifehistory. “Wood Stork.” , Life History, All About Birds – Cornell Lab of Ornithology, The Cornell Lab of Ornithology, https://www.allaboutbirds.org/guide/Wood_Stork/lifehistory. “Wood Stork: Species Profile.” National Parks Service, U.S. Department of the Interior, www.nps.gov/ever/learn/nature/woodstork.htm.